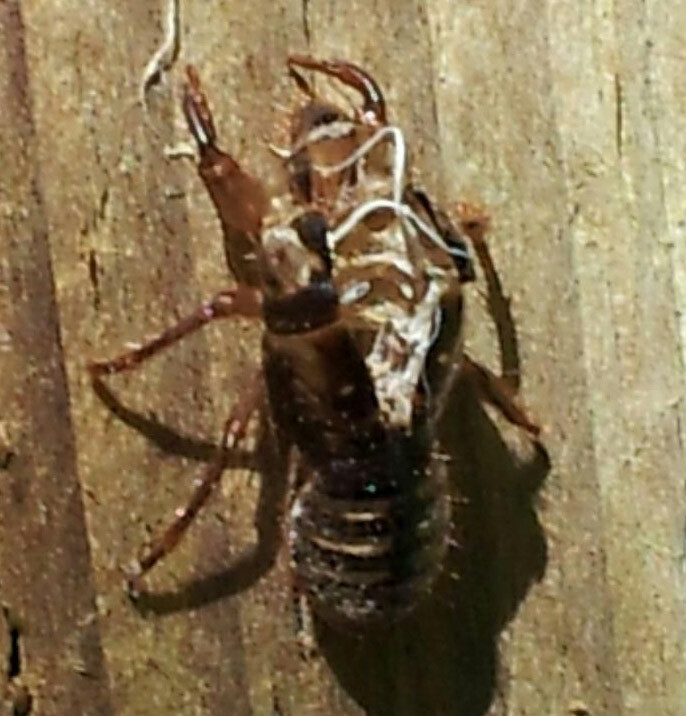 This is a photo of a what I presume is a hatched cicada or a dragon fly maybe. Somebody else (on Facebook) who saw this and took the photo. If you could confirm what it is that would be great. I found a cicada in my backyard yesterday. I had no idea they were out here in California. Yes, California is loaded with cicadas. You have species from the Genera of Platypedia, Okanagana, Neoplatypedia and Diceroprocta and possibly others. You state is very interesting when it comes to cicadas. There was a paper published in 1954 for the California Insect Survey. The paper was Entitled "The Cicadas of California" by John N. Simons. You should be able to google it and get a copy. Hope that helps. We have ear deafening sounds from I presume the cicada. It goes from low to high frequency continually all day. Perhaps the worse is in the morning or later in the evening.